“Mew!” A kitten mewed when I stroked it. The other one brushed against my legs as it walked past. Their mother sat on the ground lazily, and watched the kittens lie, lick and run. I started to stroke the other kitten and it ran between my legs. We laughed. The mother cat was named Mickey as Savithri and her family thought Mickey was a male cat and Savithri and her younger brother Shanku, ended up naming it Mickey. It was only after she gave birth to 2 kittens that they realized they Mickey wasn’t a ‘he’, but a ‘she’. Sadly, one of the kittens (Chakki) died later. And when I visited them a second time, I saw a crow lying on one of the electric post. It had got electrocuted. A murdered crow was surrounded by a ‘murder of crows’ ! Even though, that would be sad news for the crow, I was so excited. I had never seen a dead crow. Especially not one that had been electrocuted. 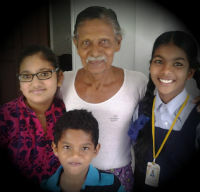 Two people from Mathrubumi came to interview Savithri’s Achachan (Grandfather). Achachan’s name is T.N. Krishnan Kutty Nair and he was a well known cinematographer who worked in more than 46 movies. It started to rain just when we decided to go beach. But we went anyway, hoping the rain would stop. But it didn’t. In fact, it started to rain even more heavily. When we got out, we took umbrellas. We saw the beach from outside the fence; we didn’t go there because of the rain. Me and Savithri stood under an umbrella, Mom and Molly Chitta under another one, and Shanku and Chittappan struggled to hold on their umbrella which was about to fly away because of the wind and tried to straighten it since the canopy had turned inside-out. Dad stayed in the car. I and Savithri laughed and we held on our umbrella and shivered when the cold wind whipped us. All of us got inside the car again, and watched the beach. Fun to read about your life in India :) Keep up the good work! 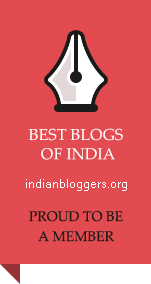 Thanks for reading, giving feedback and following the blog.